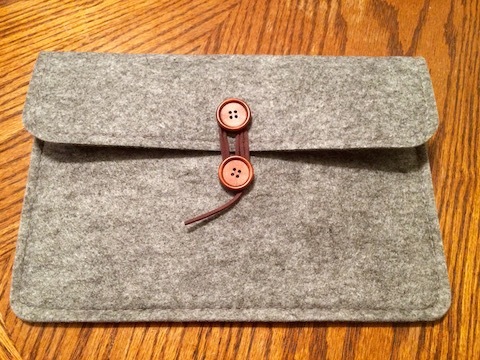 I ordered the Bear Motion iPad sleeve after spending hours researching for my recent piece, Essential iPad Accessories. The sleeve had nearly 150 reviews on Amazon with an average rating of 4.6 out of 5 stars. It looked like I had found the perfect iPad sleeve to fit my needs, but I couldn’t have been more wrong. The Bear Motion sleeve arrived last Wednesday and I was immediately turned off when I opened the box Amazon shipped it in. The sleeve came in an extremely cheap looking, peggable, clear plastic package that has no mention of what product it contained aside from a barcode sticker on the back and the Bear Motion logo along the top. This is the kind of packaging you’d expect to find on a “tablet sleeve” at a dollar store that has the build quality of something you’d find at a dollar store. My biggest concern is about build quality. Let’s be honest, $10.99 is a pretty low price. I just hope I’m more inclined to describe it as inexpensive than as cheap. After spending nearly a week with it, I can safely describe the Bear Motion sleeve for iPad as cheap. The first sign I saw of its cheap design (aside from the packaging) was actually in the sleeve’s weight. When I picked it up out of the box I was amazed at how light it was. Which would have been a good thing if the materials used in the sleeve felt as though they could protect my iPad from a tumble. But, the lack of weight was actually an indication of absolutely zero additional padding throughout the entire sleeve — save for the thickness of the outer layer of felt which feels nice to the touch, but I can’t trust to protect my $599 iPad. The inner lining is quite nice, though. It feels very soft and I would never worry about it scratching my device. 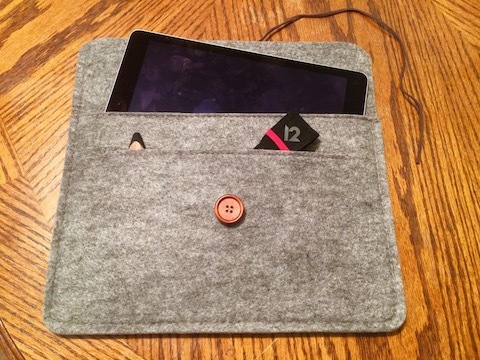 But, it’s the only layer between the iPad and the accessory pockets. I could never have any peace of mind keeping more hefty accessories inside the pockets with such a thin layer between them and the iPad. I can just imagine dropping the sleeve fully loaded and finding a completely shattered iPad screen because of the impact between it and the accessories in the other pockets. Which brings me to the closing mechanism — one button on the face of the sleeve and another on the sleeve’s flap are connected by a leather string that you wrap around the two. It works well and stood up to the intense shaking I put it through in order to test whether or not it could come undone by itself. The two buttons are attractive and the mechanism for closing is easy enough to interact with. But, I’m not fond of how the sleeve looks when it’s closed. The two outer ends of the flap tend to bow-out from the sleeve’s body instead of sitting flush against it. This could go away over time as the fabric gets worn down from use. But with all of the other problems I have with it, it’s not going to stick around long enough for me to find out. I’ve already requested a refund through Amazon, but it looks like I might have to pay shipping to return it to the seller. This is far from ideal since it means I might be out around $8 in the transaction. But, at least the money is going to UPS (a company I actually like) instead of the sellers of this terrible iPad sleeve. I suppose I wrote about the Bear Motion last week because I was excited that I could have finally found a sleeve that suited my needs. But, I also hope my hesitance to endorse it came across loud and clear in the way that I wrote about it. Everything I saw — from the reviews on Amazon to the product images — indicated that it was going to be a great sleeve, but that just wasn’t the case. Instead, we have a cheaply made sleeve with plenty of poor design decisions.